Not sure what to give that business associate for Christmas? Or that estranged Aunt that’s coming over for Christmas dinner? How about the men in your life that are always so difficult to shop for? Whether given in person or delivered through post, Christmas hampers are a thoughtful, stress-free and easy way to surprise and thrill anyone on its receiving end. 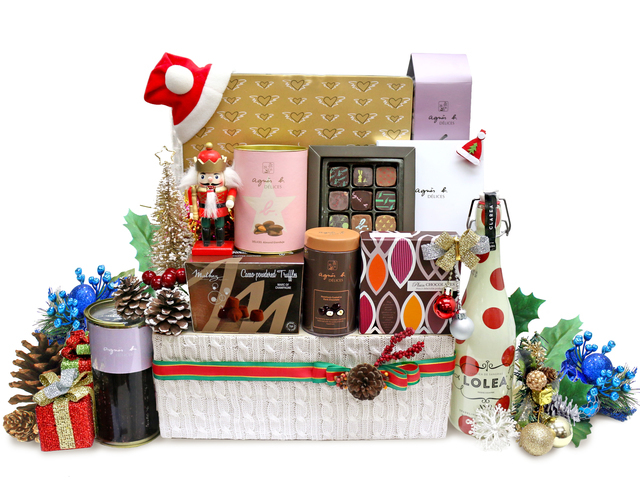 Gift Give Boutique Hong Kong has an extensive collaboration of hampers for everyone on your list. Tight budget? No problem, you can still get a stellar Christmas hamper that won’t strain your wallet but won’t look cheap either. 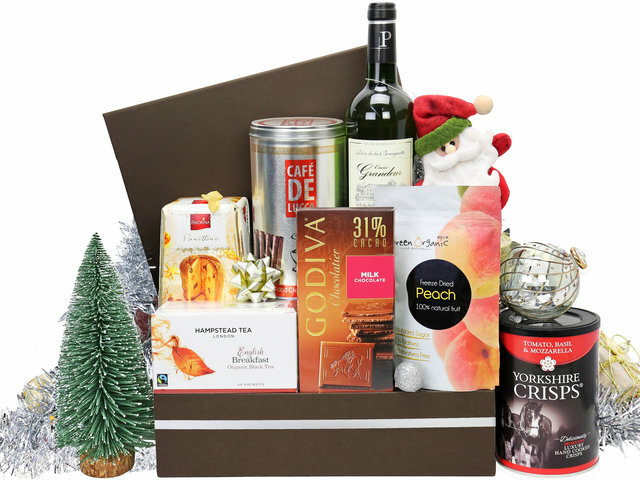 This low price Christmas hamper has nine items inside of it (including wine) at a low price. If you want something a bit more robust for that special person, co-worker or business associate this mid-priced hamper has something for everyone. Containing 14 different items from the sweet, the savory, and the decant. Looking for the crème of the crop of Christmas hampers? That one special gift that will help seal a successful year in business or perhaps an enormous gift for a family to get everyone done in one go? Look no further than the Supreme Christmas Hamper. From full tea sets, full bottles of respected wine and champagne, caviar, cookies and chocolates, this hamper has it all. Men are often difficult to buy for and really, you can only buy them so many pairs of socks, so why not treat the gents in your life to a classy and tasteful Christmas hamper they’re sure to love. This exquisite hamper contains six high-end delicacies that come in a reusable leather box. Sparkling wine and decant Agnes B. chocolates are a sure-fire way to please any lady in your life. This large Christmas hamper comes with enough chocolate, cookies and truffles to keep a smile on any woman’s face, until, well at least Valentine’s day. 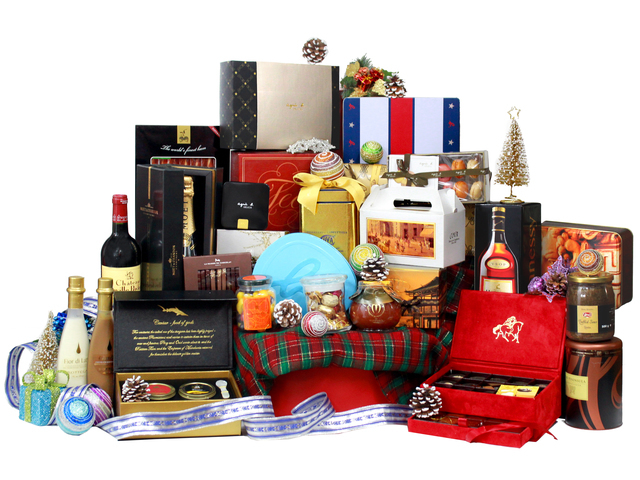 Christmas hampers are ideal gifts for business connections as they are a thoughtful way of showing gratitude or building relationships. This hamper contains brand name chocolates, biscuits, and sweets, all items that are sure to get devoured no matter what the receiver’s tastes. Comes complete with a Christmas ornament and a reusable basket. 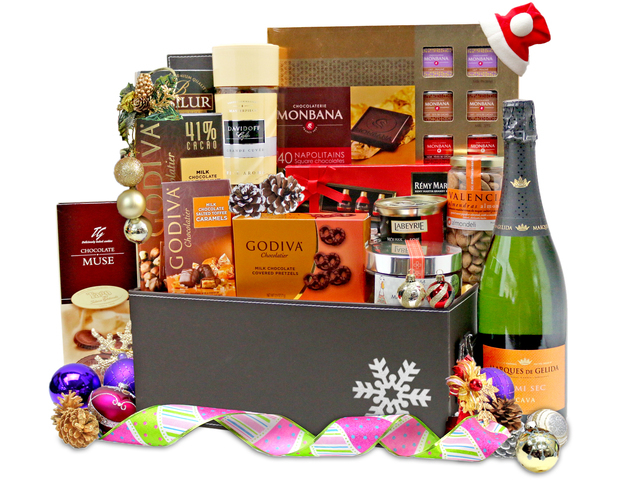 This hamper is a chocolate-lover’s dream! 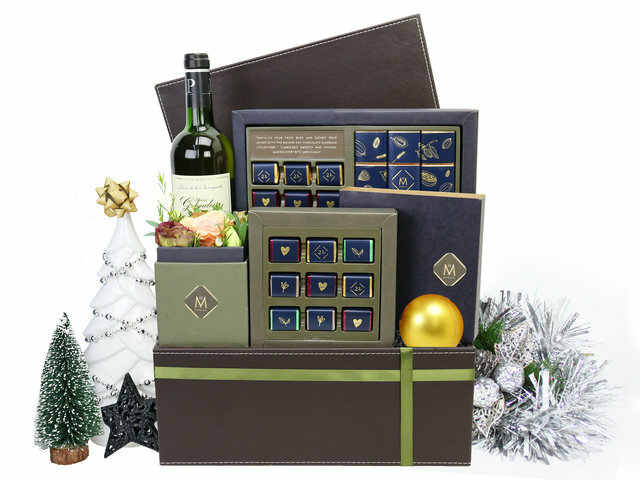 This decadent Christmas hamper contains eight Godiva chocolate items, including a bottle of chocolate liquor, and a reusable leather box. For those that love wine nothing beats receiving a bottle (or two) of some top class wine along with some perfectly paired snacks. 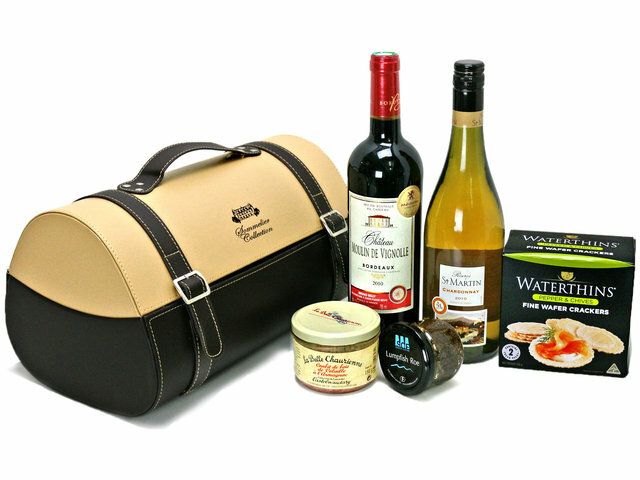 This Christmas hamper includes two bottles of wine, one white and one red, and some perfectly paired snacks that come inside a premium leather wine carrier. Everyone loves a fruit basket, especially at Christmas as it has long tradition within this gift-giving season. 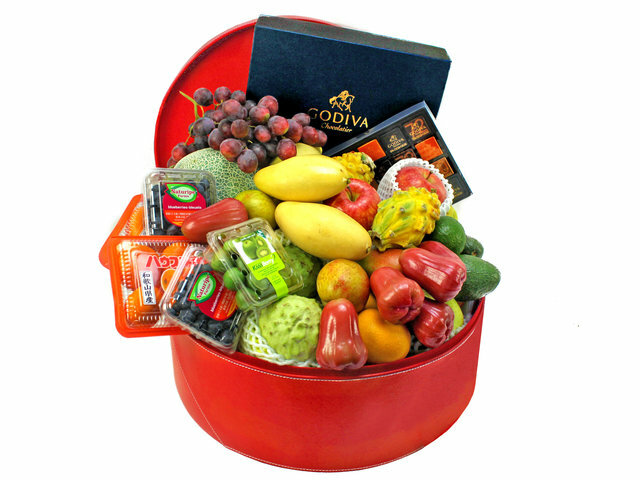 This large fruit basket contains European and Asian fruits, along with chocolate, and a reusable leather gift basket. Need a few more suggestions or looking to make some bulk orders? Give Gift Boutique has been providing Christmas hampers and delivery, online flower delivery, same day flower delivery and rush flower delivery in Hong Kong, Macau, and Guangzhou for businesses and families since 2008. For questions, orders and requests please contact us! 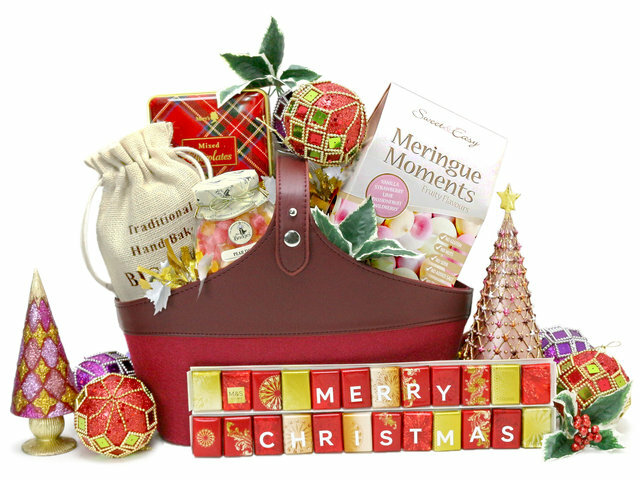 This is a Hong Kong GGB original 'Hong Kong Best Christmas Hampers' blogpost.